In the article assesses the impact of managed mixing metal in an induction crucible furnace for energy parameters of carburizing process in the production technology of synthetic iron in a modernized smelting unit based on induction crucible furnace with a capacity of 12 tons. The composition of the upgraded machine includes an additional bottom inductor electromagnetic stirring of the melt in the crucible. Sharing lower inductor agitator, lateral inductor heater and the magnetic lining can increase the speed of movement of the metal in 8...16 times because of which the energy loss during the carburization process can be reduced by more than 2 times. Key word: Induction furnace, carburization, synthetic iron, bottom electromagnetic mixer, multifunctional melting unit, magnetic lining. The article describes an induction heating method and the advantages of using induction furnaces. Constructed mathematical model heating the graphite crucible and the metal at different frequencies. The described Technology of production of cast electrodes of contact welding. Key word: Induction furnace, simulation, casting, forging, nanostructured particles, contact welding, ageing. Investigated was the behavior of 110G13L steel when melting it by different methods: oxidizing, remelting, and fusion. Impact of the melting method on the steel’s gas content was determined. Key word: High-manganese steel, melting, gas content, oxidizer. Responsible for the formation of graphite, the amount, shape and distribution of which control all the properties of cast iron are impurity components (H, C, N, O). The most rapid and effective changing the ratio of these components takes place at cyclic thermal treatment. Installed, low-temperature cyclic processing provides a fully ledeburite structure, that is unalloyed white cast iron, and responsible for the formation of graphite in cast iron is not the rate of crystallization, but primarily water vapor environment. Discovered the possibility of obtaining unalloyed white cast iron from waste blast furnace production, which is very promising from the standpoint of resource saving and creating waste-free production. Key word: Hydrogen, graphite, processing of molten, unalloyed white cast iron, microstructure. On the basis of the analysis of nature of interaction of primary aluminum with elements of Periodic system taking into account their initial contents and influence on operational characteristics of castings groups of useful, neutral and harmful elements are allocated. Key word: Primary aluminum, impurities, sacrificial alloys, antifriction composite alloys. Ways of casting of solders in the form of bars of small sections on an aluminum and zinc basis were developed. It is established, that at reduction of cross section of solder there is a reduction of the sizes of the main phase components of solders of both compositions. Key word: Cast solders on an aluminum and zinc basis, a metal form, a bar, a microstructure. A method and facility for the measurement of directional solidification alloy, that is based on a continuously registration the changes of absolute shear torsion by strain sensor mounted which is on the bottom mold, as its length changes during «freezing» in the solidified molding. 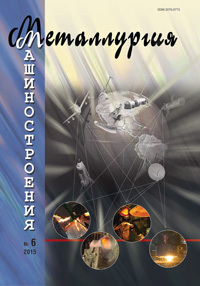 By means of the method of the crystallization rate measuring it is possible to construct thermo-kinetic diagrams of crystallization of alloys and on this basis to develop new technological processes of castings with a given structure and characteristics, and including the production of the composite castings (multilayered). Key word: Melt, casting, strain gauge, directional solidification, the absolute shift torsion. Developed and implemented with the release of industrial batch of chromium bronze method of TDP (thermo-deformation processing), according to which aging is carried out after drawing up and interim rod pre-finish size, followed by finish drawing aged piece to the finished diameter rods with a draw ratio of 1,10...1,15. Party rods treated by the method specified, fully comply with all requirements of the normative documents for hardness and longitudinal curvature, rods have a proper marketable condition with a smooth, defect-free, shiny surface, characteristic of cold-drawn products. Key word: Chromium bronzes, requirements for rods, used method and advanced TDP mode, qualitative characteristics of the product. The paper proposes a new method of production of bilayer castings with differentiated structure and properties using the technology of in-mold modification of the initial melt, smelted in a single melting furnace, which ensures formation of hard wear-resistant white iron as the working layer, and formation of ductile shock-resistant cast iron with nodular graphite as the core or the mounting part. Сonfirm the feasibility of the proposed method and provide conditions ensuring differentiation of structure and properties in local parts or layers of castings. The prospects of the method for manufacturing a wide range of industrial castings are indicated. Key word: Method, in-mold modification, bilayer castings, white iron, high-strength iron with nodular graphite.